According to an analysis of National Health and Nutrition Examination Survey data t has been found that Depression after a stroke is 35 times more deadly than its absence. 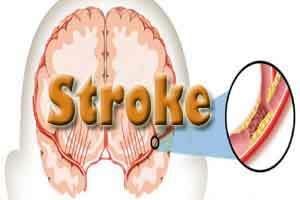 The study has been published in Journal Of Stroke And Cerebrovascular Diseases. It has been estimated that one in three stroke survivors have depression. Dr. Ali Razmara , a neurologist at Kaiser Permanente in Irvine, Calif and associates conducted a study to find out how such depression relates to all-cause and stroke mortality.The researchers used data from the nearly 10,000 participants in the National Health and Nutrition Examination Survey I Epidemiologic Follow-Up Study that was conducted during 1982-1992. The researchers stratified in total 9,919 participants who were interviewed in 1982-1984 into four groups on the basis of their self-reported stroke and depression, defined as Center for Epidemiologic Studies Depression (CES-D) scale score of 16 or higher. The groups either had no stroke and no depression (reference group), stroke and no depression, no stroke and depression, or both stroke and depression. A total of 121 (1.2%) reported prior stroke. The youngest participants, aged 25-64 years, showed no significant association between stroke or depression, or both, and all-cause mortality. In those aged 65-74 years, however, all-cause mortality was significantly affected by not only depression alone and stroke alone, with adjusted hazard ratios 1.24 and 1.64, respectively, but also by the combination of depression and stroke (adjusted HR, 2.28), “consistent with an additive relationship,” said Dr. Razmara, a neurologist at Kaiser Permanente in Irvine, Calif.
Higher stroke mortality was only observed in those aged 65-74 years (adjusted HR 2.43, 95% CI 1.05-5.60). Compared with stroke survivors without depression, those with depression were ~35 times more likely to die from a stroke (adjusted HR 35.33, 95% CI 7.79-160.32). The investigators concluded that the combination of prior stroke and depression is associated with higher all-cause mortality than either condition alone. The presence of depression after stroke increases stroke mortality 35-fold, highlighting the importance of identifying and treating depression among stroke survivors. Stroke Cerebrovasc Dis. 2017 Dec;26(12):2870-9.